·The use of technology in Arts Achieve was an opportunity for arts specialists to have another tool in their teaching toolbox. Upon discovering the possibilities that iPads and accompanying apps offered, specialists could use technology to deliver and promote student learning and reflection in the arts. Ultimately, the Arts Achieve project integrated technology into the teaching and learning of the arts in order to promote innovations in student and teacher access to content and assessment feedback. Facilitators and arts specialists were provided with iPads in order to integrate technology into the teaching and learning of the four art forms as well as to document student work. Arts specialists also received six additional iPads for use in their classes. To aid in technology integration across all disciplines, a total of 37 apps were loaded onto the iPads. Each specialist and facilitator received an iPad pre-loaded with apps, some discipline-specific and others with more general functions. Overall, students were very comfortable using iPads in the classroom. Once they were presented with an iPad, they were able to navigate apps and produce work. Based on Cooper Hewitt’s site visits, there were no instances in which students were not comfortable with iPads at all. iPads were used in a variety of ways, some more basic than others. In many instances, they were used to show images of masterworks; in others, students used discipline-specific apps for assessment. Many students used Explain Everything to record observations and formative assessment of their projects or compare and contrast masterworks. How did we manage hundreds of iPads that were distributed across the five boroughs of New York City? For ARTS ACHIEVE, we used the Meraki system manager to organize and keep track of iPad usage. How might technology inform formative assessment techniques? Teachers had the capacity to utilize technology to engage students in a way that might not have been available before. Technology may be used to identify the strengths and weaknesses of student work, build skills, reinforce learning, and transform the process of formative assessment in teaching and learning in the arts. Peer-to-peer assessment is a tool that empowers students to voice their opinions and to build skills in constructive criticism and feedback. In one theater class, students created tableaus based on moments in black history, in order to improve their ability to use facial expression. Using the iPads, each group of actors took photographs of their tableaus and shared them with another group that would review the photograph and type in feedback on how the group might make improvements. They then handed the iPad, with their notes, back to the group. Self-assessment allows students to take ownership of the creative process. Technology can assist this process by allowing students to view their work in a way that might otherwise be impossible. Using Explain Everything, visual arts students could photograph their still lifes and their art work, then place the two images side-by-side. The artists could then record their own feedback as they compared the two, highlighting areas of the piece where they succeeded or could have made other choices. The artists could reference this feedback as they revised their work. This technique can also be used for peer-to-peer assessment. Teacher-to-student assessment offers the opportunity for teachers to continually gauge students’ needs and make adjustments throughout the process of a project. One dance specialist utilized St@sh, a portfolio app that allowed students to document and upload their work to an account that she could view at any time to provide feedback. To allow for our Arts Achieve colleagues to develop a network and a sense of community, we turned to Ning. What is unique about Ning is that it allows for the creation of a social network housed in a specific website. For Arts Achieve, the Ning page was developed as a space for all the different stakeholders to communicate and share work. The Ning page was also beneficial as a common space where all important documents and content, such as technology tutorials, could be found. Initially, Ning also served as the place where content was saved from the first two years of the implementation of the grant. 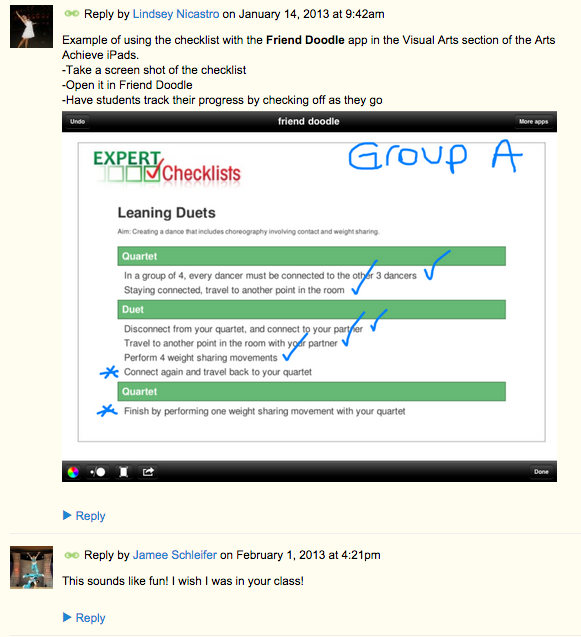 Using Ning's discussion forum, dance specialist Lindsey Nicastro shares strategies for distributing checklists. Colleagues respond to Lindsey's tips. As facilitators and arts specialists were teaching, they were also documenting their students along the way. As a result, many photos, videos, recordings, and other content were stored directly on the iPads. We approached Dropbox as a solution for organizing all this content, while allowing for continued documentation on the iPads. The Dropbox app became a very important tool for specialists and facilitators. The app allowed them to automatically upload from the iPad’s camera roll and to easily organize files. For this project, we created a Dropbox for Business account with 30 terrabytes of storage. The Digital Assessment Pilot investigates the potential for enhancing performance assessments in the arts through web-based technologies. Assessments in four arts disciplines were administered digitally, using iLearn, a web-based platform. In Spring 2013, Cooper Hewitt began with beta tests for fifth-grade students to determine the viability of this platform. This beta test pioneered the use of iLearn with elementary school students and developed successful protocols for administering the quiz with this audience. By Spring 2014, the pilot expanded to include twenty-four digital assessments in ten schools across New York City. A total of 326 students ranging from grades 5-12 were enrolled in the pilot. The iLearn website was selected as the portal for the assessment because of its learning management capabilities, as well as its seamless connection to the students’ ID numbers and New York City Department of Education records. The platform is currently being utilized in over 250 schools across New York City and is at the forefront of digital learning management for secondary education. Students using this platform can access courses not currently offered in their schools and can complete assignments on the computer in or outside of school. For the pilot, no student grades or scores were assigned or recorded by the schools, and the pilot has no bearing on the student's grade.